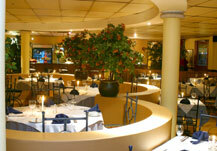 Lagosta offers excellent, friendly service in a sophisticated, yet relaxed atmosphere. The fine Portuguese cuisine and seafood make Lagosta popular venue for romantic dinners and special occasions. Lagosta offers an excellent light lunch menu which has become very popular amongst locals and business executives from the Centurion and Midrand business districts. Lagosta caters for a variety of functions including birthdays, anniversaries, weddings, engagements, christmas parties and work socials. Book out the restaurant and use the centre as a dance floor or book as many seats as you wish (up to 300 people) Your guests have the choice of a set menu or a platter style menu. A seperate function room is available for small conferences or parties. Open Lunch noon - 2.30pm dinner 6pm - 10.30pm. Cnr John Vorster & Logan Ave.